February Current Affairs. Important Current Affairs Questions – 2nd February 2019. Daily Important Current Affairs. 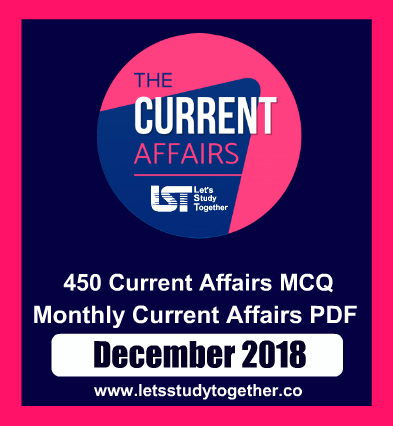 Daily Current Affairs PDF. Welcome to the www.letsstudytogether.co online Current Affairs section. If you are preparing for IBPS PO/Clerk, Canara Bank PO, banking & Insurance, SSC , Railways and other competitive exams, you will come across a section on the Current Affairs. Here we are providing you “Important G.K. & Current Affairs Questions “ in PDF format based on the current events for your daily practice. 1. Finance minister Piyush Goyal announced a capital expenditure allocation of Rs __________ for the railways. Explanation: Finance minister Piyush Goyal Friday announced a capital expenditure allocation of Rs 1.58 lakh crore for the railways, the highest ever for the national transporter, in an effort to put its flagging revenues back on track. Goyal, who is also the Railway minister, said so far, 2018-2019 has been the safest for the Indian Railways and all unmanned level crossings on the broad gauge network have been completely eliminated. 2. Who recently assumed the appointment of Director General of NCC (DGNCC)? Explanation: Lt Gen Rajeev Chopra assumed the appointment of Director General of NCC (DGNCC) here today. Commissioned in the Madras Regiment in December 1980, Lt Gen Chopra is an alumnus of the National Defence Academy, Khadakwasla and Indian Military Academy, Dehradun. Lt Gen Rajeev Chopra has commanded an infantry battalion in Operation Rhino (Assam). He has commanded a Brigade in Eastern Command and was Inspector General of HQ IGAR (South) in the insurgency-torn state of Manipur. The General Officer commanded a Corps in Eastern Theatre and has also been the Commandant of the prestigious Infantry School. He is also the Colonel of The Madras Regiment since Jun 2016. 3. PETROTECH-2019, the 13th International Oil & Gas Conference & Exhibition, is all set to be inaugurated on __________. Explanation: PETROTECH-2019, the 13th International Oil & Gas Conference & Exhibition, being organised under the aegis of the Ministry of Petroleum & Natural Gas, Government of India, is all set to be inaugurated on February 10, 2019. India’s flagship hydrocarbon international conference is expected to be inaugurated by Prime Minister of India. Over 95 Energy Ministers from partner countries have been invited by the Minister for Petroleum and Natural Gas to participate in the Conference. The three-day mega event will showcase the recent market and investor friendly developments that have taken place in the India’s oil and gas sector. It is expected to see participation of over 86 eminent speakers and 7000 delegates from around 70 countries, including technologists, scientists, planners, policy-makers, management experts, entrepreneurs, service-providers and vendors. 4.________ took over as the Flag Officer Commanding-in-Chief of the Western Naval Command. Explanation: Vice Admiral Ajit Kumar P, PVSM, AVSM, VSM took over as the Flag Officer Commanding-in-Chief of the Western Naval Command on 31 January 2019 at Mumbai. He succeeds Vice Admiral Girish Luthra, PVSM, AVSM, VSM, ADC who retires upon superannuation, after an illustrious career spanning nearly four decades in the Indian Navy. At an impressive ceremonial parade at the Naval Air Station Shikra, the outgoing and incoming Cs-in-C were accorded a guard of honour after which they proceeded to the Headquarters of the Western Naval Command for a formal handing-taking over. On completion, Vice Admiral Luthra was “pulled out” in true Naval tradition. 5. The United Nations Security Council has adopted a resolution to extend sanctions against the CAR for another year. Expand CAR. Explanation: The United Nations Security Council has adopted a resolution to extend sanctions against the Central African Republic (CAR) for another year. Resolution 2454, adopted unanimously yesterday by the 15-member council, decides to renew the sanctions regime – an arms embargo, travel ban and asset freeze till January 31, 2020. It also decides to extend the mandate of the panel of experts, which helps the Security Council with the implementation of the sanctions, until Feb 29, 2020. 6.In Bihar, _________ was appointed as new Director General of Police (DGP). Explanation: In Bihar, Gupteshwar Pandey today appointed as new Director General of Police (DGP). He succeeds K S Dwivedi, who retired today. Gupteswar Pandey is a 1987 batch IPS officer. Prior to this appointment he was DG of Bihar Police Academy and Bihar Military Police. 7. The Defence Acquisitions Council (DAC) chaired by __________ approved indigenous construction of six submarines worth 40 thousand crore rupees. Explanation: The Defence Acquisitions Council, DAC chaired by Defence Minister Nirmala Sitharaman approved indigenous construction of six submarines worth 40 thousand crore rupees. It is the second project under the Ministry’s ambitious strategic partnership model aiming to boost the government’s Make in India’ program. 8. Foreign direct investment (FDI) during the previous fiscal grew ____ per cent to Rs 28.25 lakh crore, data from the Reserve Bank of India (RBI) showed. Explanation: Foreign direct investment (FDI) during the previous fiscal grew 18 per cent to Rs 28.25 lakh crore, data from the Reserve Bank of India (RBI) showed Monday. FDI increased by Rs 4,33,300 crore, including revaluation of past investments, during 2017-18 to reach Rs 28,24,600 crore in March 2018 at market value, according to RBI data on ‘Census on Foreign Liabilities and Assets of Indian Direct Investment Companies, 2017-18’. The RBI said as many as 23,065 companies responded to the latest round of the census, of which, 20,732 firms had FDI or ODI in their balance sheet in March 2018. Overseas direct investment (ODI) by Indian companies increased by 5 per cent to Rs 5.28 lakh crore. 9.___________ will be set up for the welfare of cows in the country. Explanation: In the Interim Budget 2019-20, Union Minister Piyush Goyal on Friday announced that a Rashtriya Kamdhenu Aayog will be set up for the welfare of cows in the country. The government will allocate Rs 750 crore for Rashtriya Gokul Mission from the current year itself. It will set up a Rashtriya Kamdhenu Aayog to upscale sustainable genetic upgradation of cow resources and enhance production and productivity of cows. The Aayog will also look after effective implementation of laws and welfare schemes for cows. 10. GST on Haj has been reduced from 18 per cent to ____ per cent recently. Explanation: Union Minister for Minority Affairs Mukhtar Abbas Naqvi said that GST on Haj has been reduced from 18 per cent to 5 per cent and this will significantly lower the air fare thus saving Haj pilgrims’ 113 crore rupees this year. Mr. Naqvi said this for the first time since the independence that 2,340 women from India will go on 2019 Haj without Mehram. 11. Finance minister Piyush Goyal recently announced a relief package of Rs _________ under a new scheme PM Kisaan Samman Nidhi. Explanation: Finance minister Piyush Goyal announced a relief package of Rs 75,000 crore under a new scheme PM Kisaan Samman Nidhi for distressed farmers who have seen their incomes stagnate because of plunging prices, barely enough to pay for loans and input costs. 12. The MHA (Ministry of Home Affairs) has been recently allocated Rs ___________ in the budget 2019-20. Explanation: For the first time, the allocation for the Ministry of Home Affairs (MHA) in the Budget has exceeded Rs 1 lakh crores. The Interim Budget 2019-20 was presented by the Union Minister for Finance, Corporate Affairs, Railways & Coal, Shri Piyush Goyal in Parliament today. The MHA has been allocated Rs 1,03,927 crores. This is Rs 10,477 crore more than the Budget allocated for the MHA last year. 13.Shri Rajiv Nayan Choubey, recently took the oath of office and Secrecy as member of ______. Explanation: Shri Rajiv Nayan Choubey, took the Oath of office and Secrecy as Member, Union Public Service Commission today. The oath was administered by Shri Arvind Saxena, Chairman, UPSC. An officer of the 1981 batch of Indian Administrative Service of Tamil Nadu Cadre, Shri Choubey during his career spanning over more than 35 years, has held several important positions in the Central Government as well as in the Government of Tamil Nadu. He served as Joint Secretary in the Department of Economic Affairs, Development Commissioner (Handloom) in the Ministry of Textiles, Director General in the Directorate General of Hydrocarbons, Ministry of Petroleum & Natural Gas, Additional Secretary, Ministry of Power, Special Secretary, Ministry of Power and prior to his joining the Commission, he was serving as Secretary in the Ministry of Civil Aviation. 14.Finance Minister proposed to increase the limit for tax deduction at source (TDS) on interest income from Rs 10,000 to Rs _______ per annum. 15.Under Pradhan Mantri Kisan Samman Nidhi, Rs _______ per year for each farmer, in three installments, to be transferred directly to farmers’ bank accounts. Explanation: Presenting his first Union Budget, finance minister Piyush Goyal said that the government has approved the Pradhan Mantri Kisan Samman Nidhi in effort to provide assured income support for small and marginal farmers. “Under Pradhan Mantri Kisan Samman Nidhi, Rs 6,000 per year for each farmer, in three installments, to be transferred directly to farmers’ bank accounts, for farmers with less than 2 hectares land holding,” Goyal said.